Other changes were more unexpected. 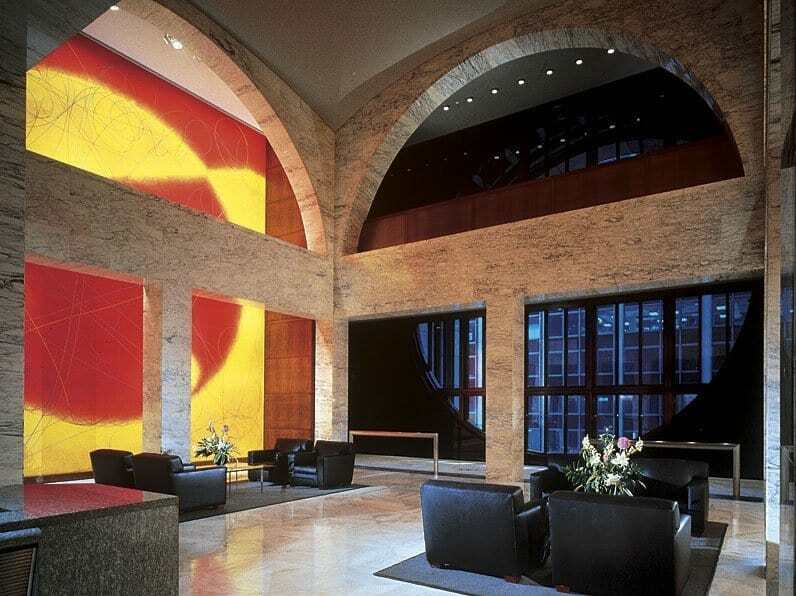 Gwathmey Siegel Kaufman redefined the Sony Atrium and Public Plaza as an accessible enclave of activity with a strong presence on Madison Avenue. Enclosing the soaring, 60-foot-high arcades flanking the north and south sides of the original building with aluminum-framed bay windows recast the previously open spaces as two entertainment retail stores. The special interior features of the retail spaces incorporate superscale images and exhibition, media, and display systems, as well as banners, flags, neon lights, and music. The former annex building contains a series of new spaces, including a newsstand, commissary, ticket booth and the Sony Wonder Museum. Organized around theatrical motifs, the museum is an interactive, state-of-the-art attraction featuring electronic display signs and graphics meant to enhance visitors’ understanding of communication through technology. In the ground-floor lobby, sheets of dramatic black glass have been inserted into arched recesses to offset the original granite walls and Lutyens-patterned inlaid marble floor. Black glass paired with anegre veneer recurs at significant points throughout the 35 floors. Color-coded elevator lobbies clearly express each Sony division—yet materials, colors and interior detailing provide a cohesive visual impression. The original perforated metal pan ceiling detail installed by Philip Johnson and the basic core organization were retained. What is new is a rigorous architectural approach to layering the space, both vertically and in plan, as well as in the custom-designed workstations and reception desks.